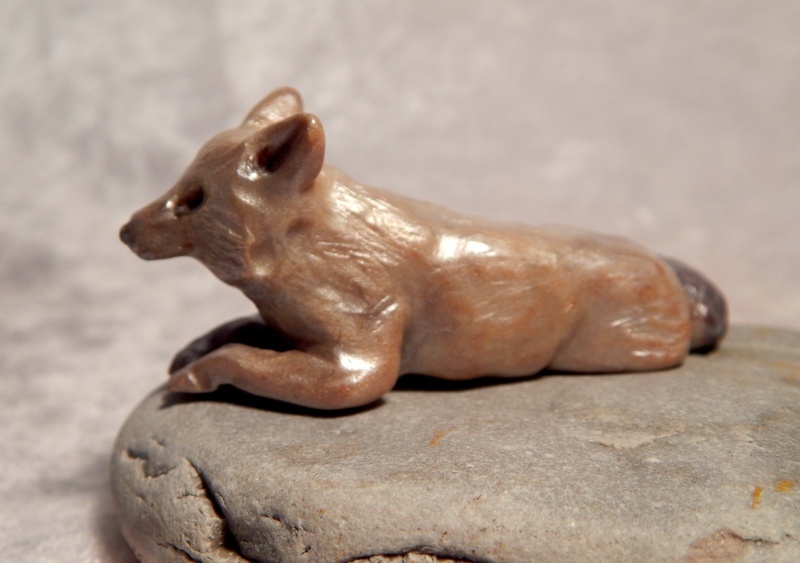 I am quite excited to say that I have finally successfully sculpted some wolves! It took me a while and several false starts before I got three pieces that pleased me. For some reason, red foxes come fairly easily to me, (see Red Fox, Napping Fox, and More Brooches) but wolves were a different story. Foxes are somewhat cat-like and flexible, and they like to strike cute, sculptable poses, such as curled up in a furry ball, or sitting daintily with their tails wrapped around their legs. This is in strong contrast to wolves, who in most of the pictures I've seen, stand stiffly on their long, difficult-to-sculpt legs, glaring balefully at the photographers. I was determined, however, and started with a young black wolf in a sitting position. 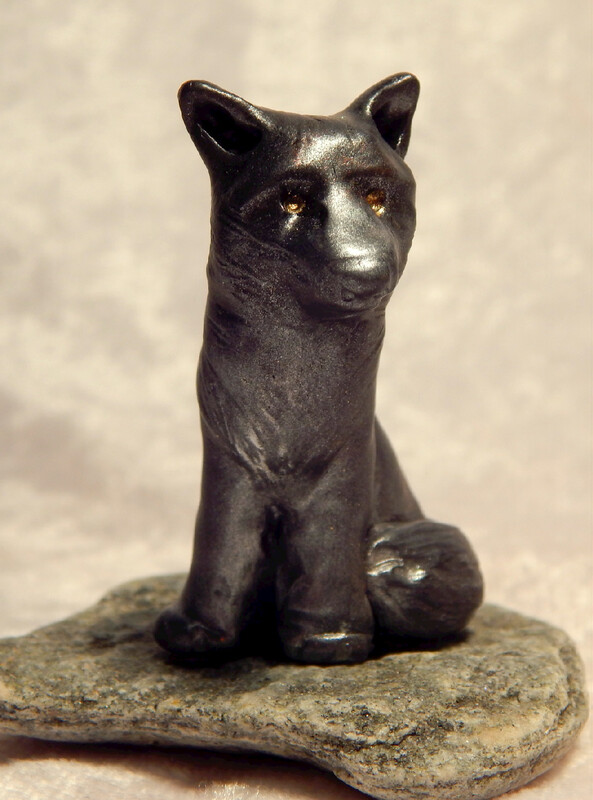 He came out well, his amber eyes contrasting nicely with his dark fur. I wanted to try a fully mature wolf next, and decided he would be in a relaxed, resting postion, with silvery gray fur this time. I was happy with the result of this sculpture, after quite a bit of work to get it right. The last wolf in this trio is a silvery white wolf, lying down with her head up, alert and watchful. She was a challenge to sculpt and also took some time to get right. But she was worth the work, and I am happy with all three of these wolves. For the last couple of weeks, I've been trying variations of a new technique. 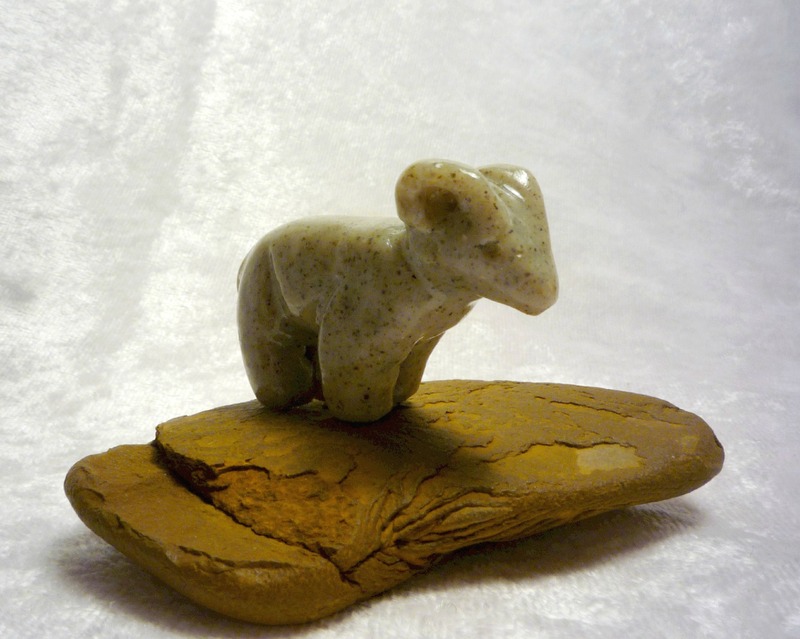 Inspired by Inuit stone carvings, which are fairly simple, often beautiful renditions of animals, birds, and people, I decided to sculpt some polymer clay figures that have a similar look. 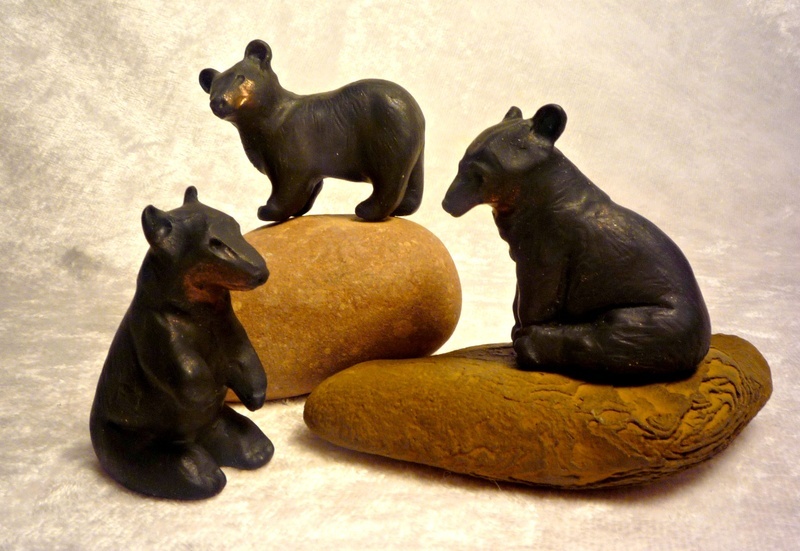 I wanted them to look as if they were carved from stone, so the clay itself had to look stony, and the sculpting technique had to be simpler, less delicate, than many of my pieces so far. 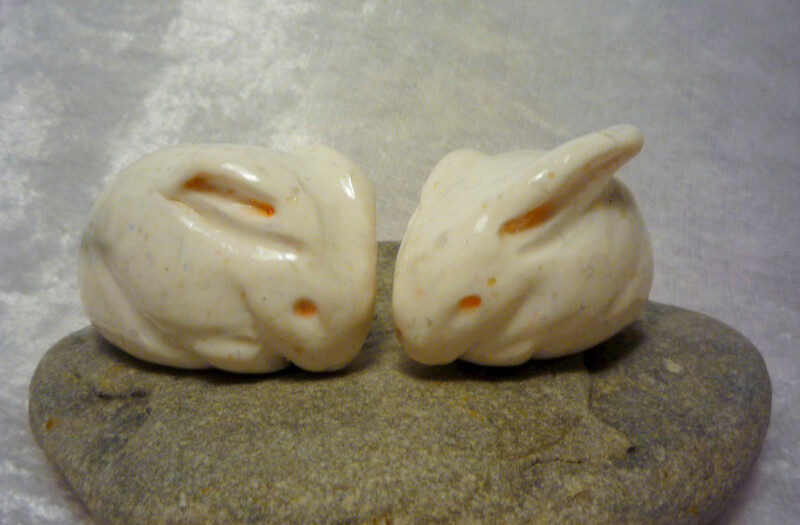 For my first few pieces, I used "White Granite" Premo polymer clay, and chose rabbits for my subject (Easter is coming, after all). I was very pleased with how they turned out. 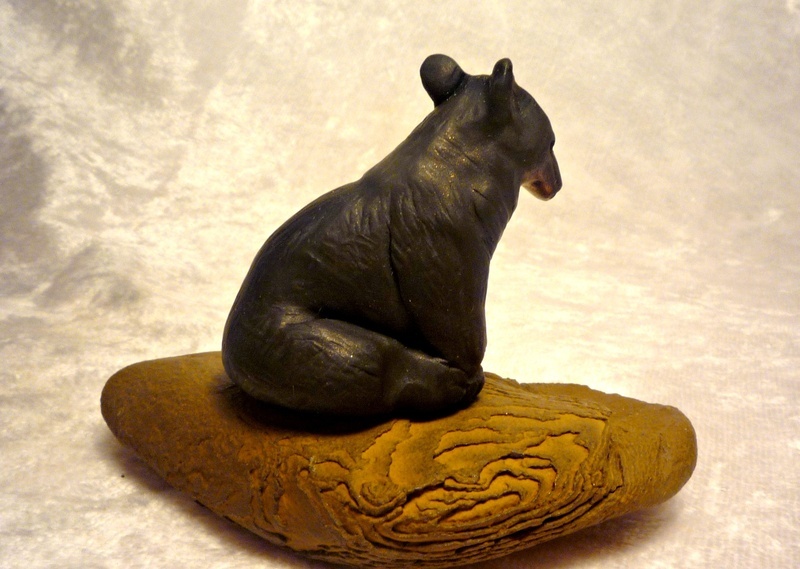 Next, I used "Gray Granite" Premo and sculpted a bear and a goat. 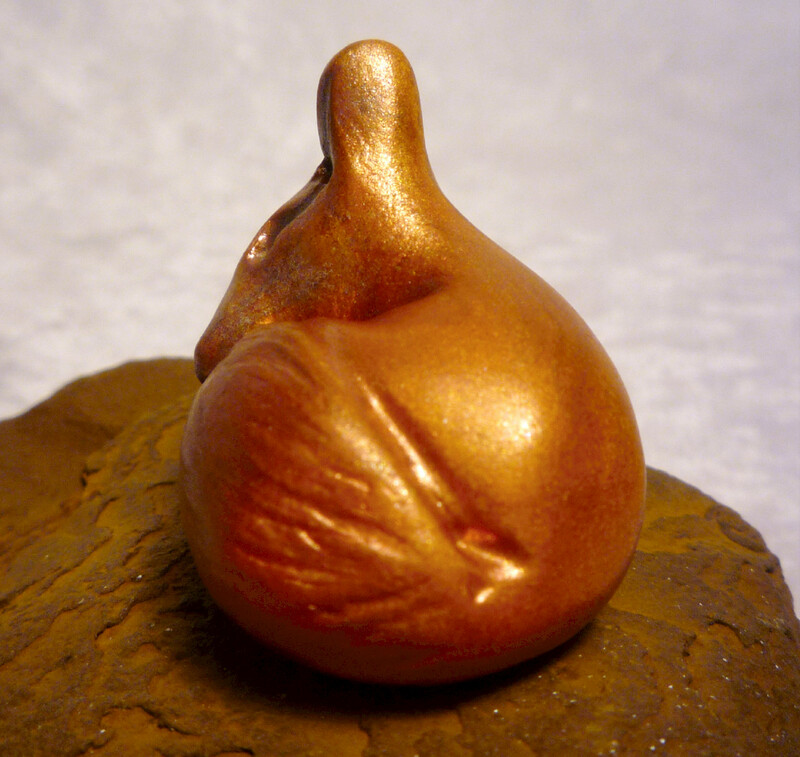 I found that this type of clay looks better if it is varnished afterwards, so the pieces look like polished stone. 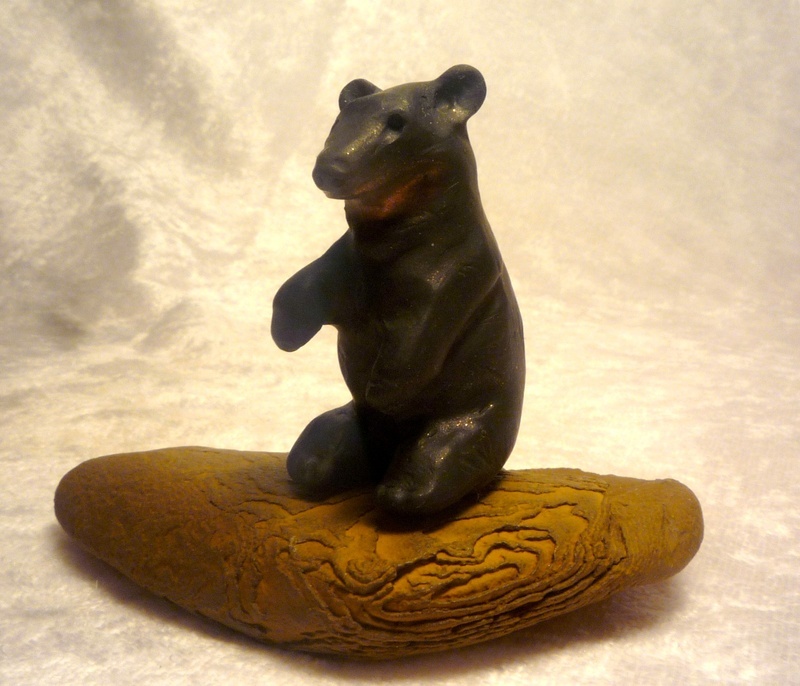 I especially like the way the bear turned out. 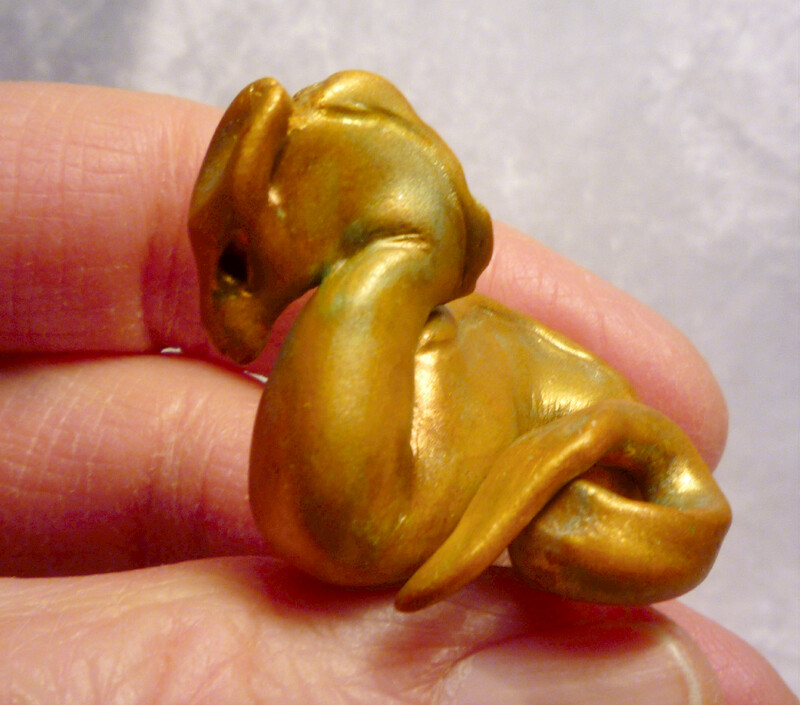 Last night, I used some "Pearl" Premo polymer clay and mixed in some pepper and cardamom spices to give the clay some texture. The result was swirly and slightly speckled, looking similar to marble after baking. 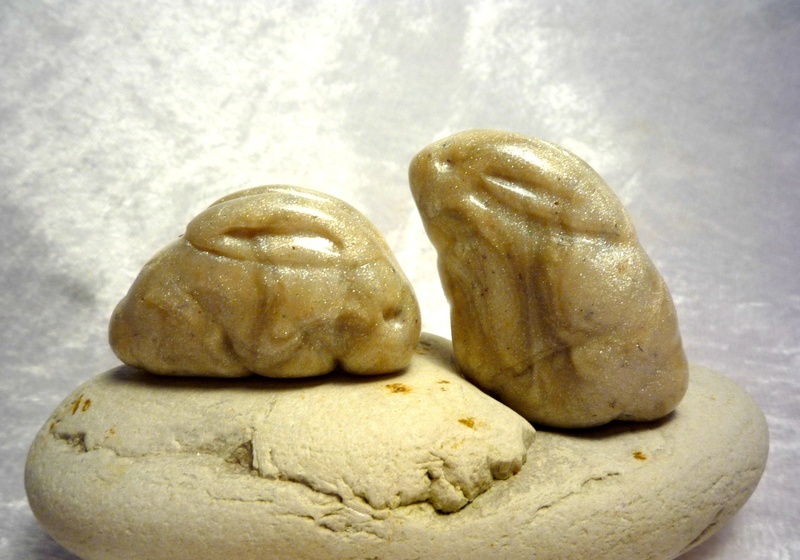 I made a couple more rabbits out of this clay. I decided not to varnish these pieces. All in all, I have mixed feelings about these carved-stone-look techniques. Some of them I really like, and others I am more luke-warm about. 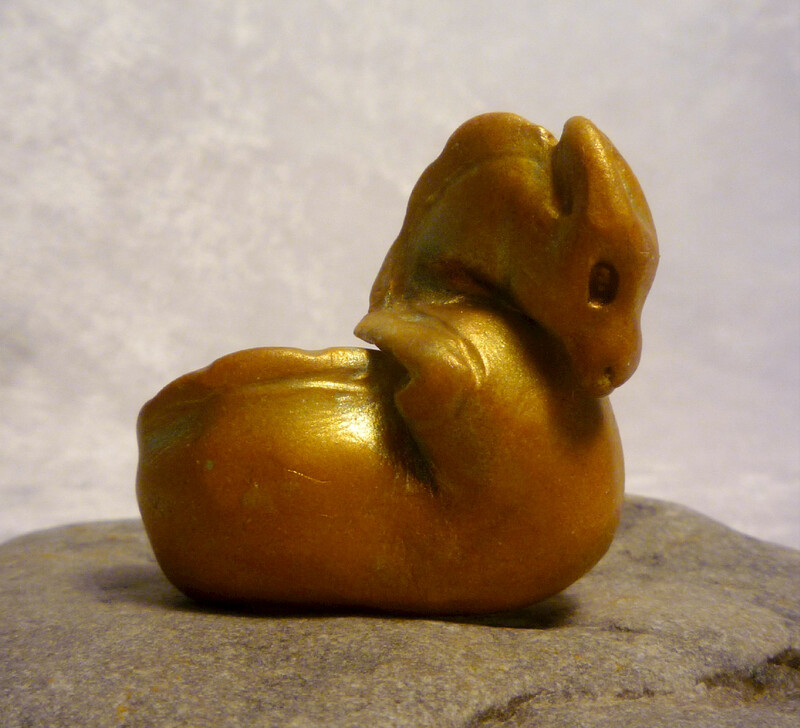 Probably I will go back to my mica-powder-finished sculpting style for a while. 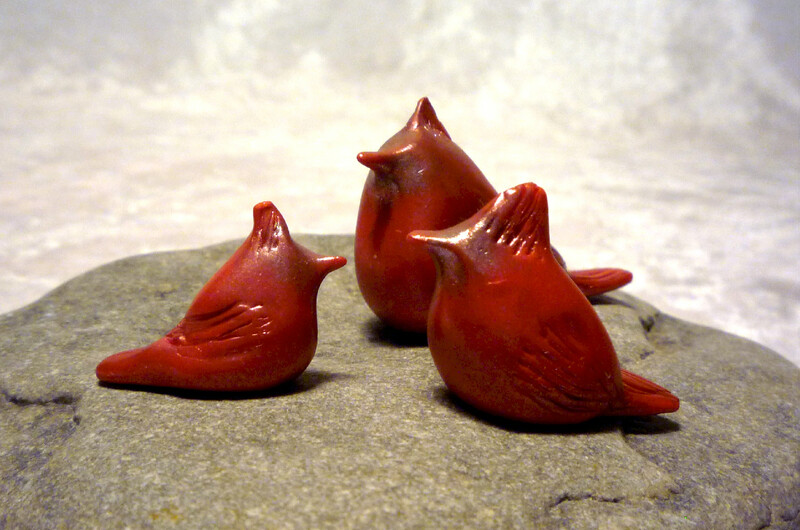 I always like to experiment and push my boundaries, however, so I'm sure I will never stop trying out new ideas and following new inspirations for my sculpting in polymer clay. I made another red fox this weekend. 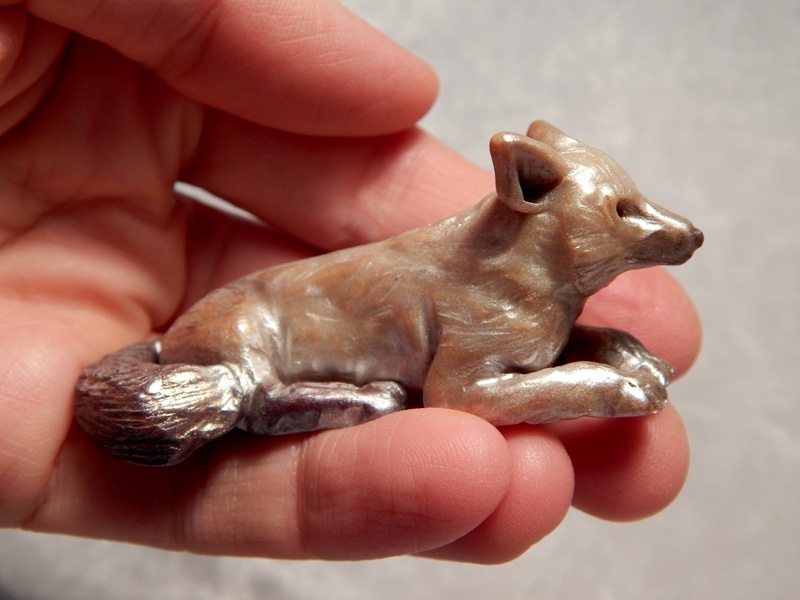 I had made a sitting red fox a few weeks ago which I blogged about here and listed in my Etsy store. This one is a tiny napping fox all curled up. 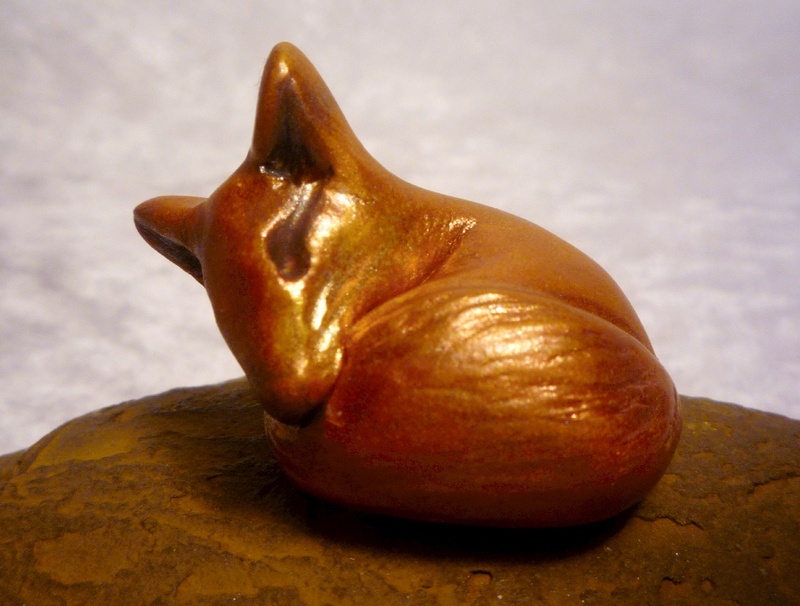 Not too much to say about him, except that he is simpler than the other fox, and started with a darker gold base clay, so his final color is darker as well. He's pretty cute, I think. 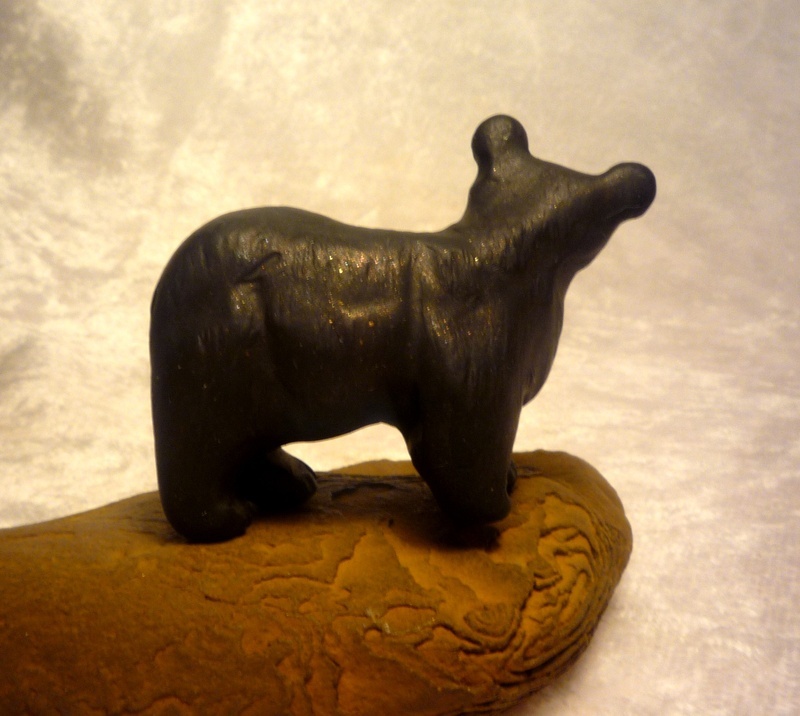 He got a listing in my Etsy store too, but has been sold and is in his new home. I don't know what it is about Sea Serpents. I just love them lately. See my two other posts about them here, and here. They are so sinuous and serpentine. And their heads are fascinating to me, too. 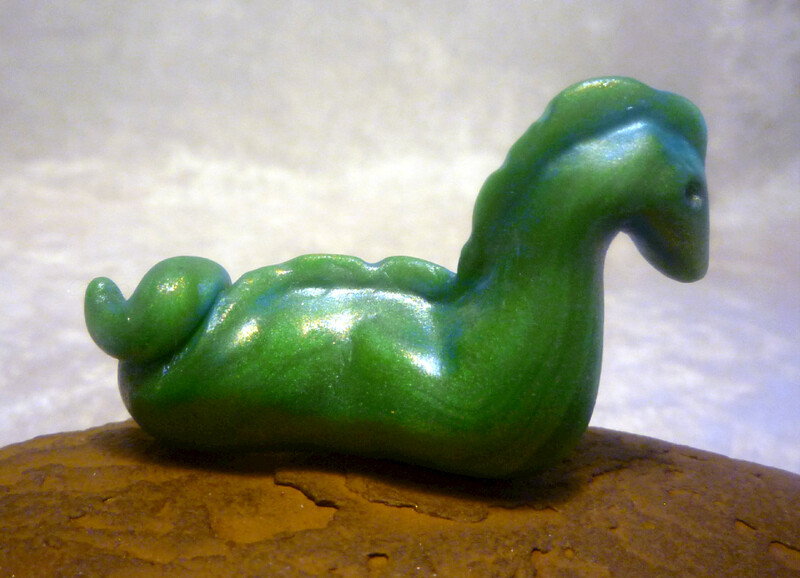 This time I wanted to make a sea serpent that looked more like a dragon than a horse. He still has a bit of an equine look to him, the way he arches his neck, but he is actually a water dragon, not a hippocampus. This guy gave me a little trouble here and there, as befits a dragon. It was difficult to position his head just right so it pleased me. He kept tossing it about. His tail has a dragon-style point to it, arrow shaped. And he's nicely coiled about himself. I went with an interference gold color mica powder, highlighted with a duo green-gold color. That means that the color changes a bit as he moves. 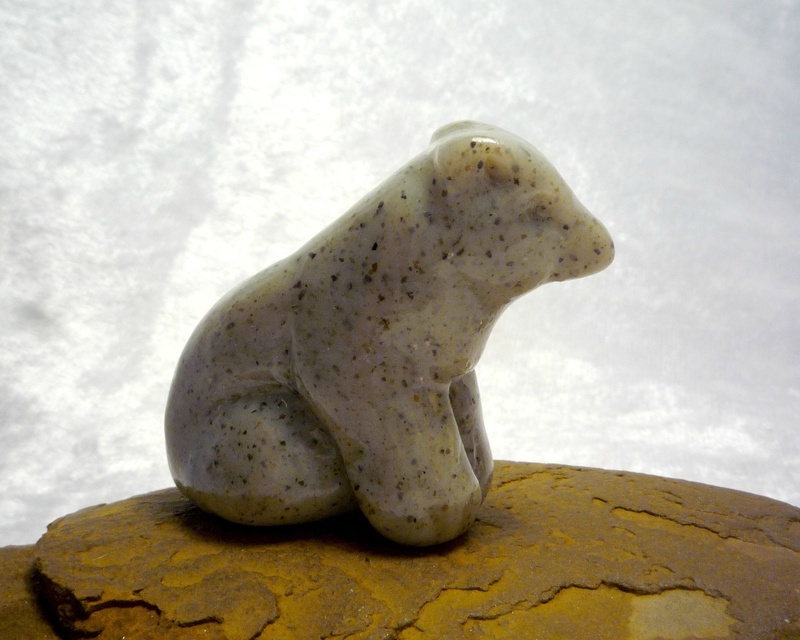 He was listed in my Etsy shop, but has since sold, and is now happy in his new home. I wanted to make something for Valentine's Day that wasn't too cutesy, so I came up with the idea of a pair of white doves, preening each other as bird pairs do. It was a nice idea, and I really liked the shapes of the doves I sculpted, but the white clay turned out to be a lot of trouble. In the end, I had to paint both of the pairs of doves that I made with white acrylic paint, which I then antiqued with silver and lightly varnished. 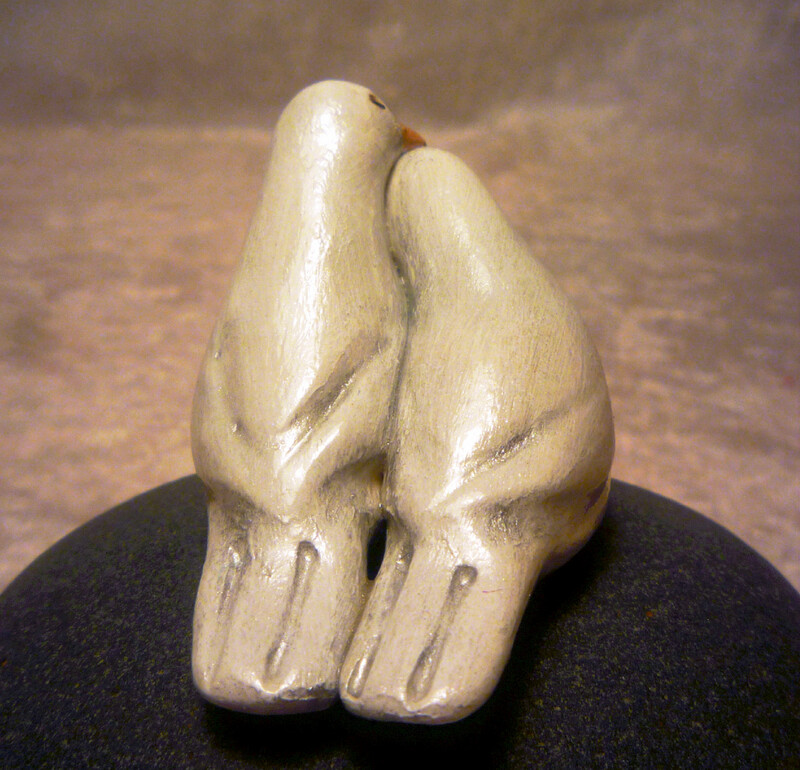 The dove pairs (I made two pairs) ended up having a distressed, antiquey look to them. This was not my original vision, nor is it my usual style, but I like it pretty well. I decided to list my dove couples on Etsy, and see if anyone wants to adopt them. 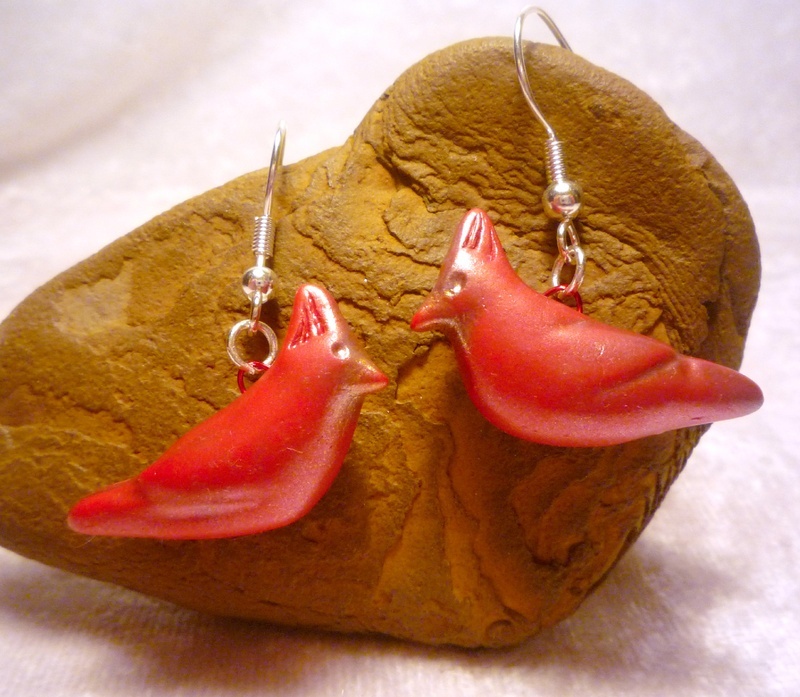 See my earlier post called Valentine's Day Cardinals for a different bird pair I have listed on Etsy. 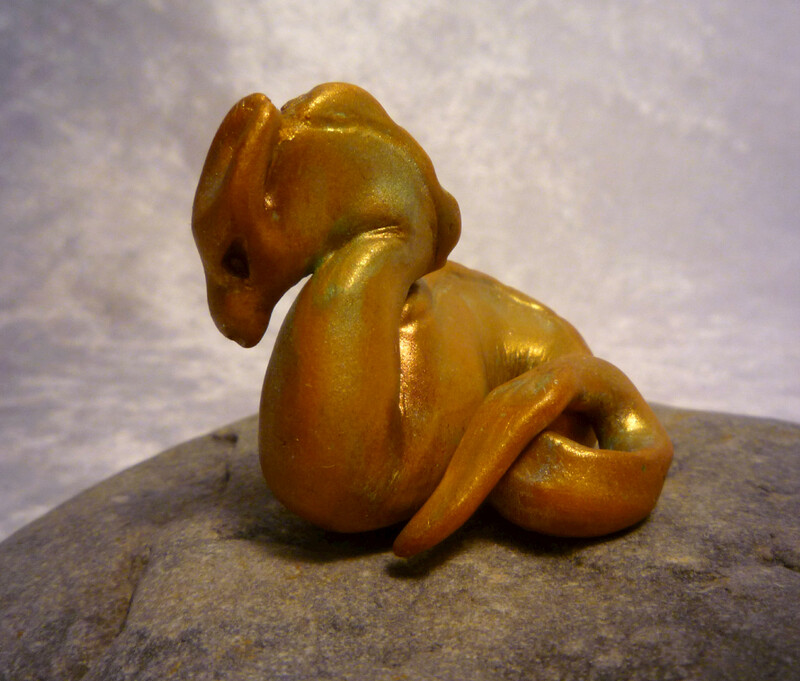 I love to make fantasy creatures, and I worked on dragons last weekend. One larger dragon, and a little green sea serpent. 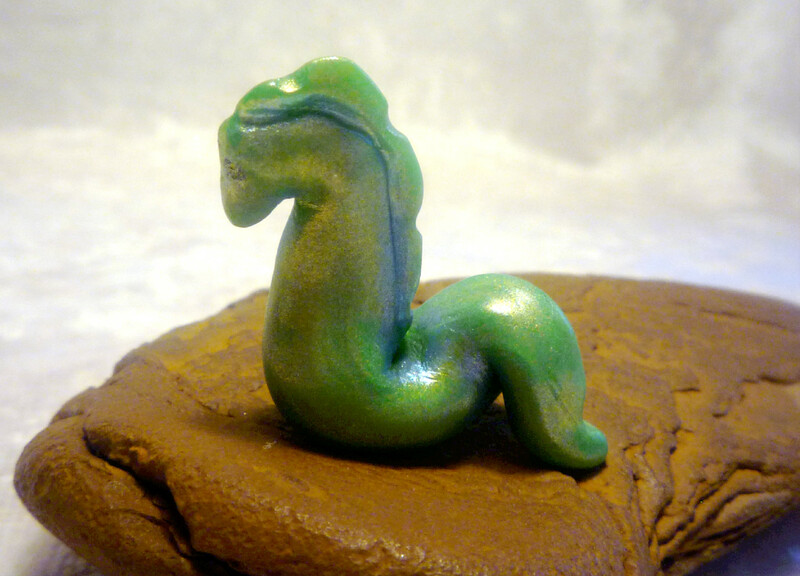 The dragon didn't work out too well, but I liked the tiny sea serpent. 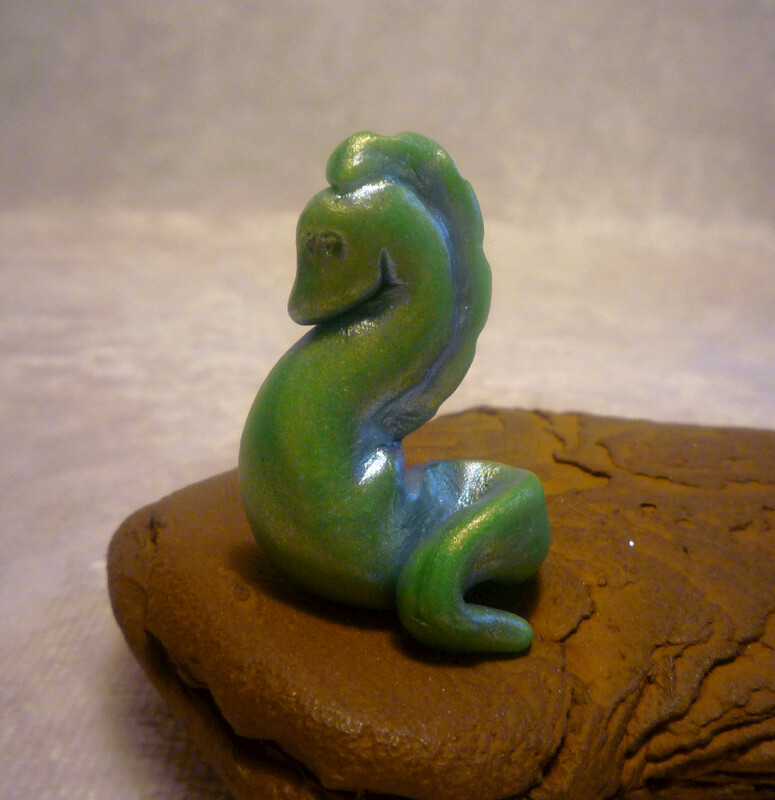 He is in the style of a water horse, or a hippocampus, although he doesn't have fins. He does have a horse's head. 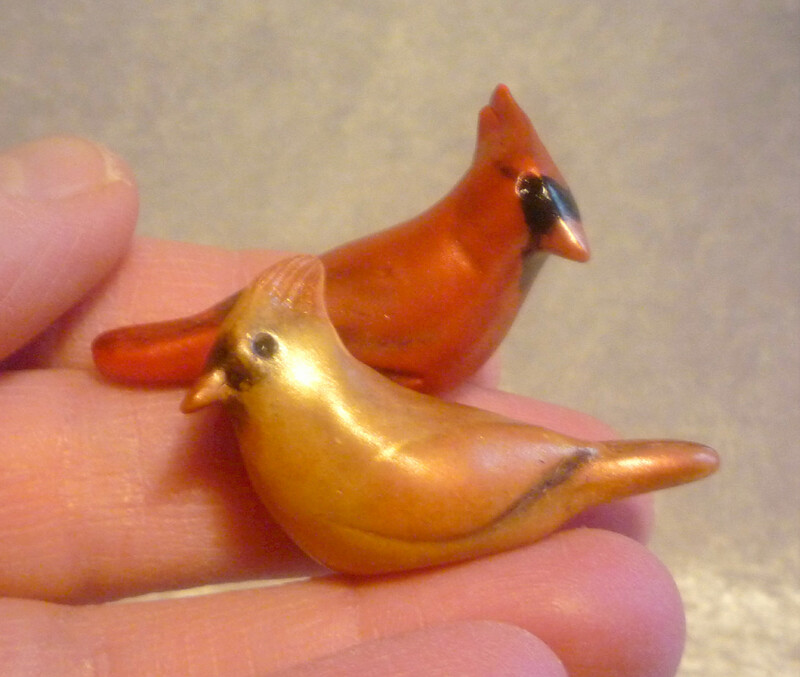 I liked him so much that I made two more, and then some tinier charms as well, which I made into earrings. 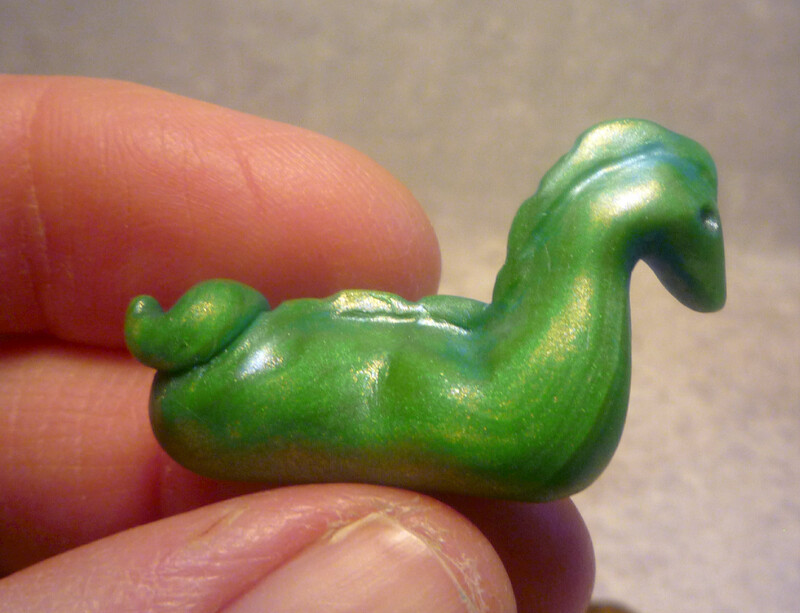 I posted the first three water horses today in my Etsy shop. I am rather pleased with them. One of them is my favorite, but I'm not saying which (don't want to hurt anyone's feelings). I have included a picture holding one of them to give an idea of the scale. I have been thinking of some ideas for Valentine's Day figurines. I don't do cutesy, so it was kind of hard to figure out what to do. Birds seem to be my favorite subjects, so I decided to do some bird pairs and offer them for sale for Valentine's Day gifts. 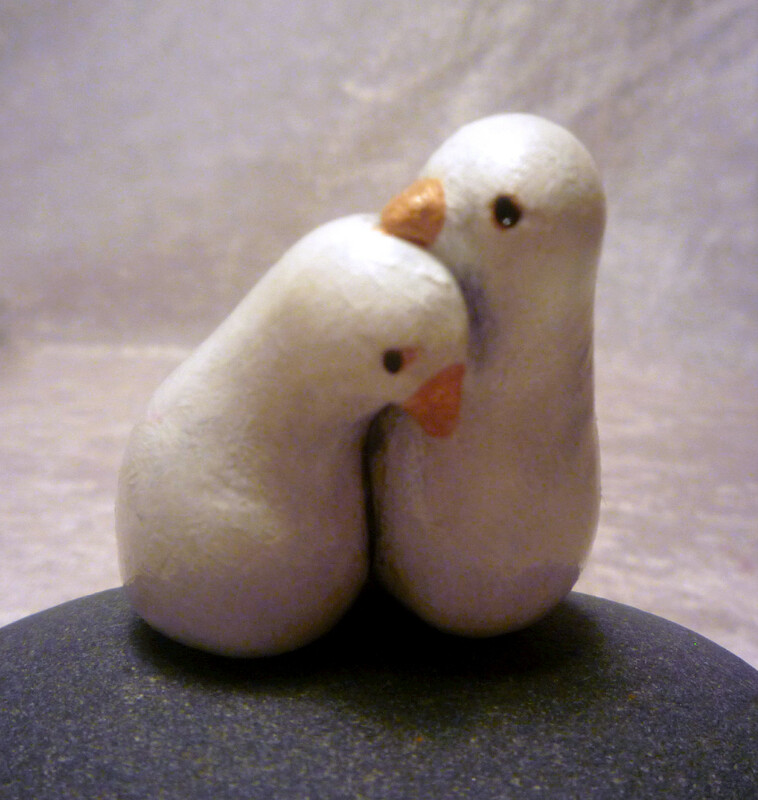 See my post Loving Doves for another bird pair. 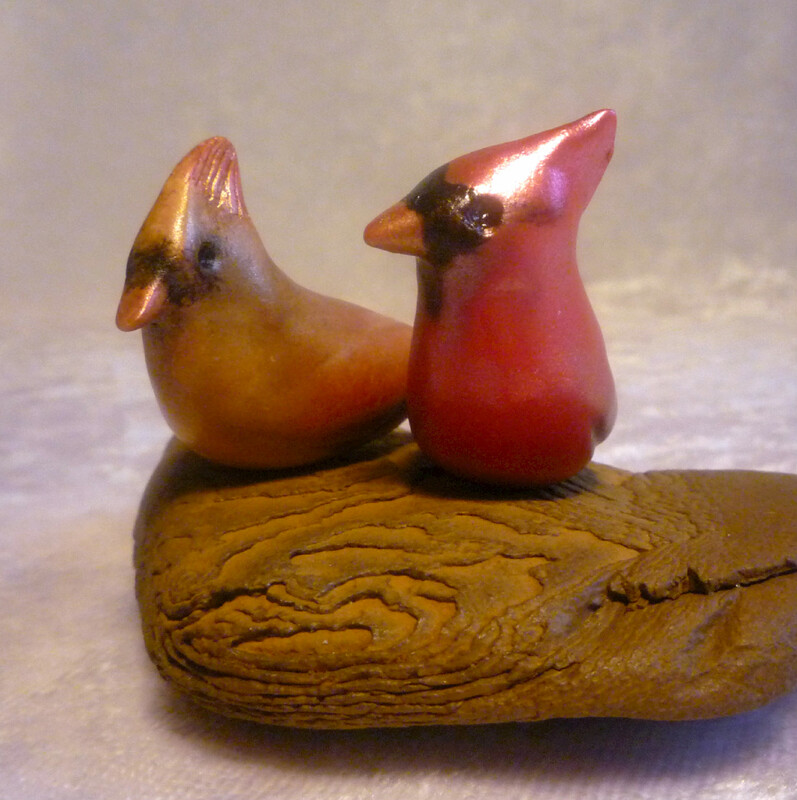 I already had a female cardinal listed and a male finished but not yet listed. I took down the single female listing and took some photos of the pair together. I really liked the way they came out, so I did a special listing of the two birds together. Some more crows put up on Etsy today, in three different styles and sizes. Well, three styles and two sizes, I guess. 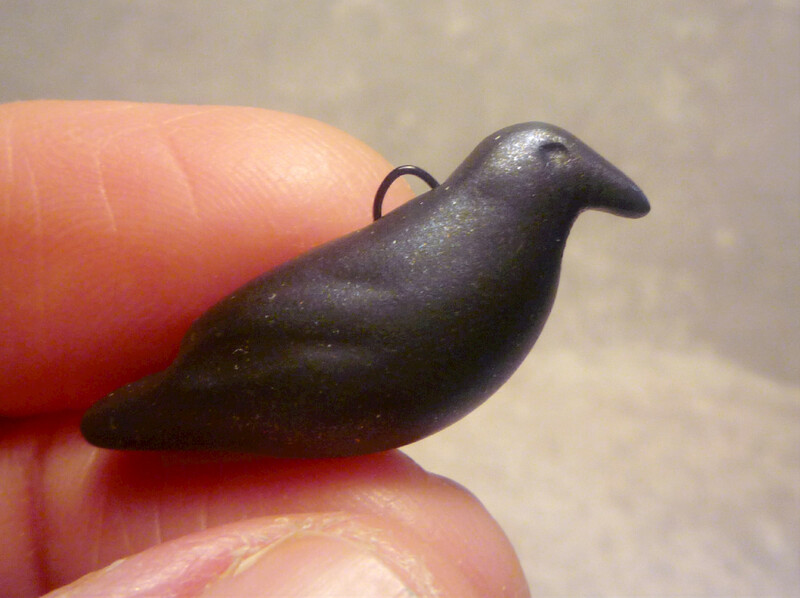 Two charms, one in my usual style: shaped and rubbed with mica powders, charm wire inserted, then baked. The other was handled exactly the same way, and after baked was wiped with metallic black paint and varnished for a shiny finish. They are both small charms. 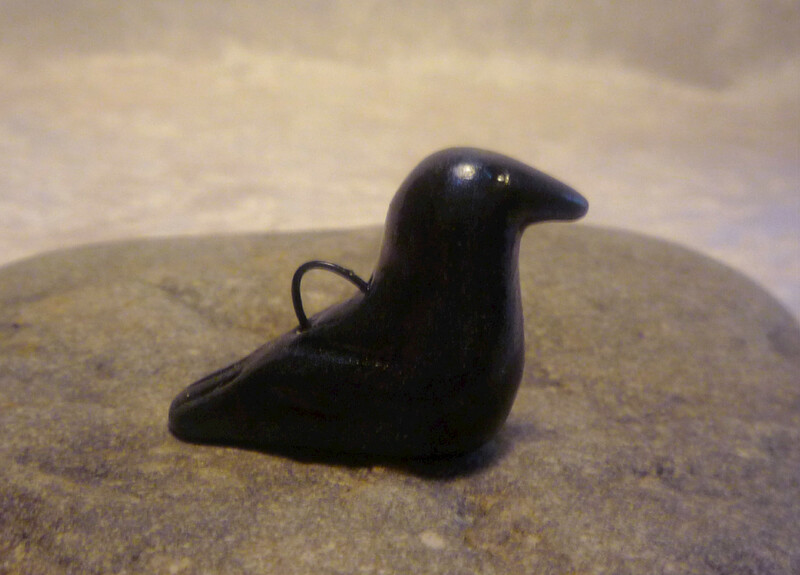 The other, bigger crow is still a miniature, about 1 1/4" by 3/4". 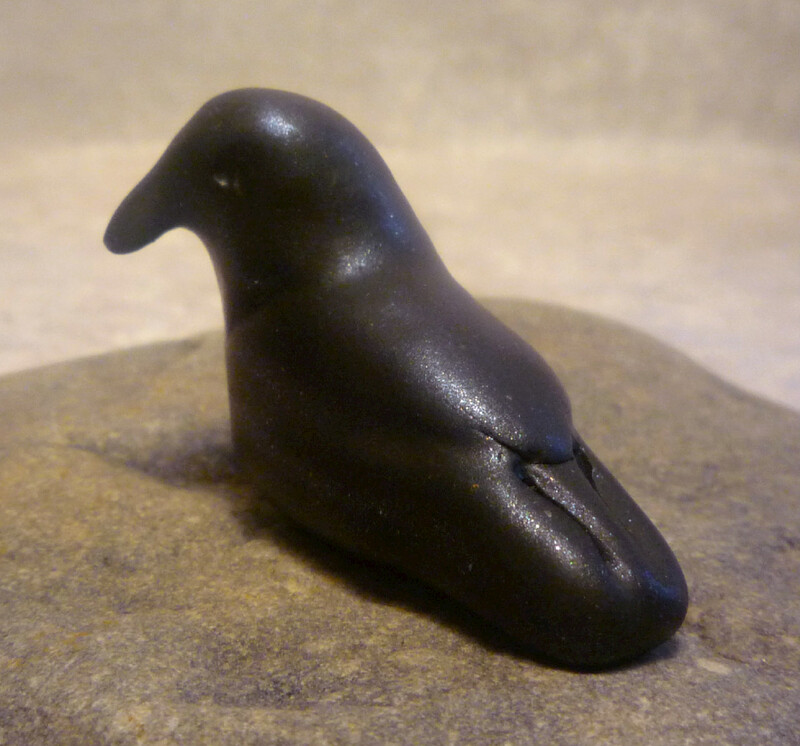 He is similar to the even larger crows I posted a few days ago. 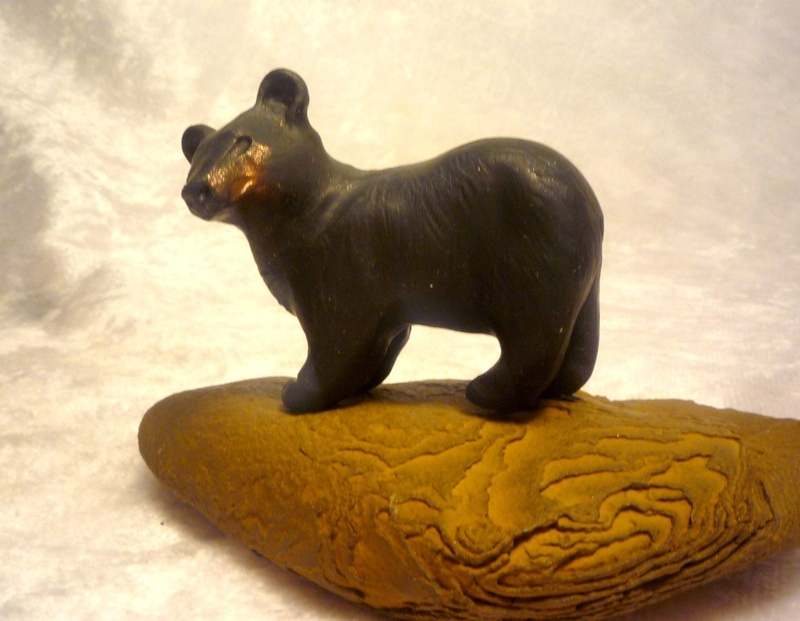 He is sculpted in a style similar to Japanese netsuke, but black. 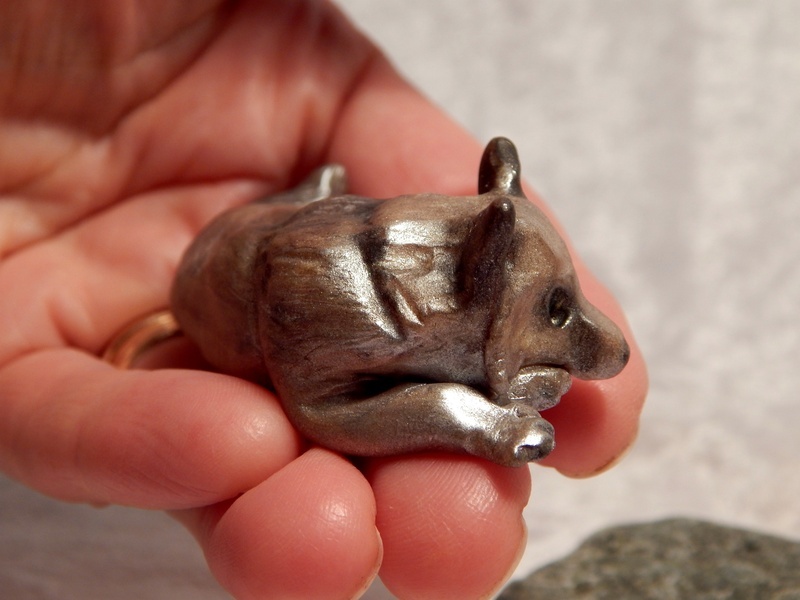 Netsuke were often carved out of ivory.